Batman v Superman is a superhero film without the heroes. The first time we see one of the titular crime fighters in action, he’s smashing Metropolis into a 9/11-esque hellzone. When the other vigilante makes his debut, the whole scene is presented as a homage to the horror classic Alien, with Batman as xenomorph, hiding in the corner until he springs out into the room like a monster in the dark. Who the antagonistic force of Dawn of Justice actually is raises questions. Jesse Eisenberg’s millennial mogul-turned-madman Lex Luthor is an obvious starting point, but the heroes don’t actually realise he’s the bad guy until three acts in. The rest of the time, it’s Batman (Affleck) who’s casting the shadows, causing problems for the God-like Superman (Cavill), a hero who it seems is dividing the movie’s world into fanboys and haters. That creates quite an interesting sort of comic book movie, and so it’s a shame when the final act brings Lex into the fore, and spits out another monster to set hell loose. It’s an ungraceful move. Suddenly, Lex is a loony gone wild, kidnapping people and creating devils. Why he does this is as murky as the super-ness of our heroes, which is a shame considering the consideration given as to why Batman has such a Superman-sized chip on his shoulder. The monster Lex creates – on a ship straight out of Prometheus, fittingly enough – extends the film for far too long, and is neither needed nor carefully set-up. But you probably already knew that. We all saw the trailer. Well, at least this Doomsday beast (Robin Atkin Downes) doesn’t appear earlier to stink up the rather intriguing beginning acts, with all their horror, adrenaline, and – Eisenberg aside – stellar showings from the main cast. Look, anyone who thinks this is a bad movie should go and watch at least one episode of Gotham. Now there’s an example of getting your comic book sources all wrong, something Dawn of Justice barely does. 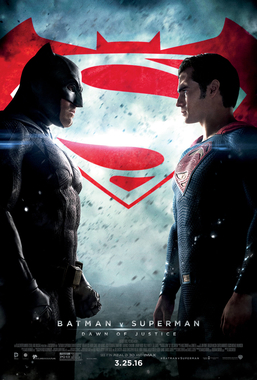 The movie feels like a comic book brought to life, jettisoning the James Bond realism of the Nolan Bat-trilogy for something far more expansive and visual, as befitting the Superman/Batman comic book series of last decade, where the super duo teamed up to fight aliens and versions of themselves from parallel universes on a monthly basis. That said, various scenes weirdly echoes 2008’s The Dark Knight, showing how quickly ingrained Nolan’s film has become in pop culture that it’s not only inspiring homage in this new cinematic Bat-universe already, but also that it’s a film too difficult to tear away from eight years down the line. The greatness of that movie still feels all too soon, and perhaps casts too dark a shadow on the world of these heroes. After all, didn’t that story also end with the last minute introduction of a monster (Two Face) as created by a madman (Joker), against which two heroes (Batman & Gordon) had to square off against? In Nolan vs Snyder, it’s Christopher Nolan who wins.